Last week I attended Microsoft Ignite in Orlando and on Tuesday I presented a session on hosting RDS and VDI in the Cloud. This blog post is a recap of the session including links to demos I showed. I started my session with the question whether RDS or VDI would still be relevant today. I pointed out that the application landscape of an average organization today already contains a lot of SaaS and Web based applications. Also, Apps from App stores are becoming more common in the corporate world. These types of applications are already enabled for the modern workplace and can already be accessed from any device at any time. I continued by pointing out the traditional Windows Applications. How these types of applications are not enabled for the modern workplace, that they demand a Windows Desktop to run and that in many cases they rely heavily on an application backend. I talked about how many might argue that the Windows Application will disappear in the future. That the Windows Application will be transformed into other form factors like Web-Based and Apps. I agree with that statement but showed the diagram below indicating that the number of Windows Applications currently still out there is in the millions and that these types of Applications have different requirements. 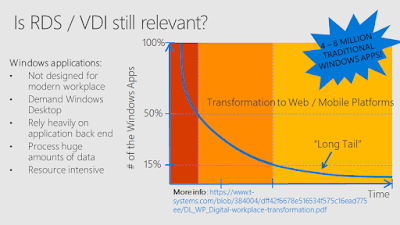 Key take away being that as long as Traditional Windows Applications exist, RDS or VDI can still help you provide those traditional Windows Applications on top of the modern workplace. 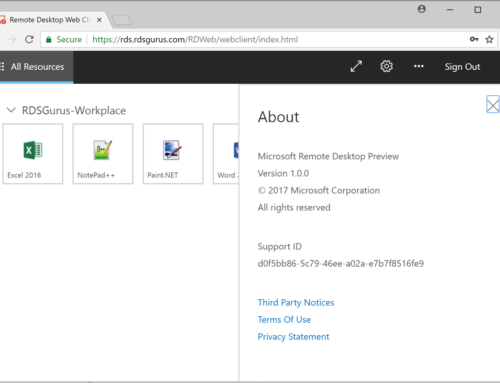 After the introduction, I covered what it takes to run RDS or VDI on top of Azure. I talked about ways to optimize for the Cloud by leveraging PaaS like Azure SQL. 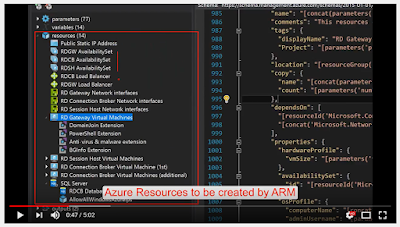 I shared ways to auto scale an RDS or VDI environment on Azure IaaS by using scaling scripts. I also talked about ways to integrate Azure MFA into an RDS environment. I got a good turn up for my session and a lot of positive feedback! I want to that everyone who attended my session and hope to be back next year! If you have additional questions about the topics I covered, feel free to reach out!